Like a chunky guacamole studded with green garbanzos, this mixture is delicious served on greens, used as a dip, loaded in pita bread, or eaten with a spoon. Green garbanzos are young chickpeas, and taste like a cross between chickpeas and edamame. If you can’t find them, swap in edamame instead. 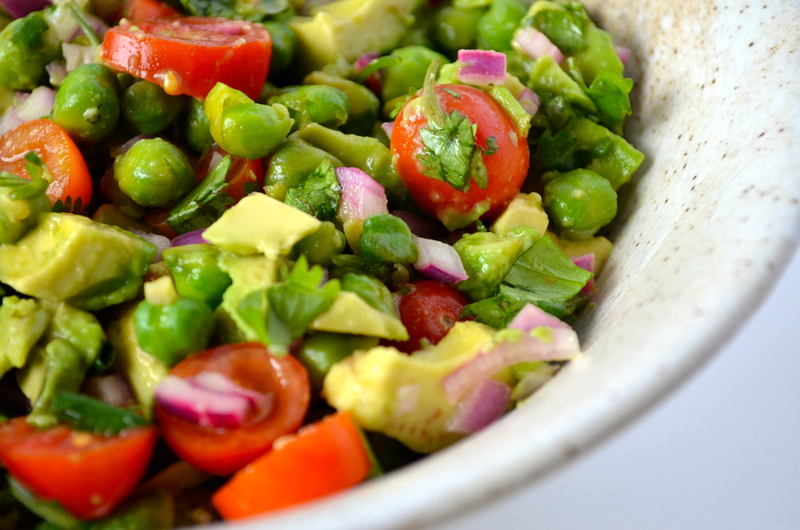 Put the green garbanzo beans, cherry tomatoes, cilantro, red onion, lime juice, garlic, and olive oil in a medium bowl. Mix to combine. Slowly stir in the avocado, keeping the pieces chunky. Season with salt and pepper to taste. Serve cold or at room temperature. A bit of sweet, a bit of tang, a bit of creaminess, and a lot of flavor. This coleslaw is the perfect canvas for adding in your favourite ingredients. Try sunflower seeds and dried cherries for an alternative to the pecans and raisins. And take the time to grate your own cabbage—it tastes much better than the pre-bagged versions. I love Mutsu apples in here, but I know they aren’t available everywhere, so I made some more common suggestions below. Using a box grater, mandoline, or the shredder on a food processor, shred the cabbage, carrots, and apples. Toss together in a large bowl. Finely chop the greens of the onions. Add them to the cabbage, along with the pecans and raisins. Toss to mix. Put the avocado, the lemon juice, a pinch of salt in a food processor. Turn on and process until smooth. With the motor running, add the olive oil, starting with 3 tablespoons, adding an additional tablespoon for a thinner consistency (depending on the size of your avocado). Add the vinegar. Stir to mix, adding additional salt and lots of ground black pepper to taste. Mix with the cabbage mixture, letting the flavours sit for at least a couple hours before serving.